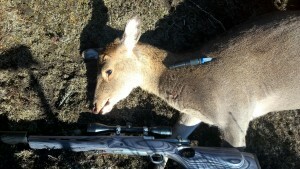 First deer with the new Boyd’s stock on my rifle. 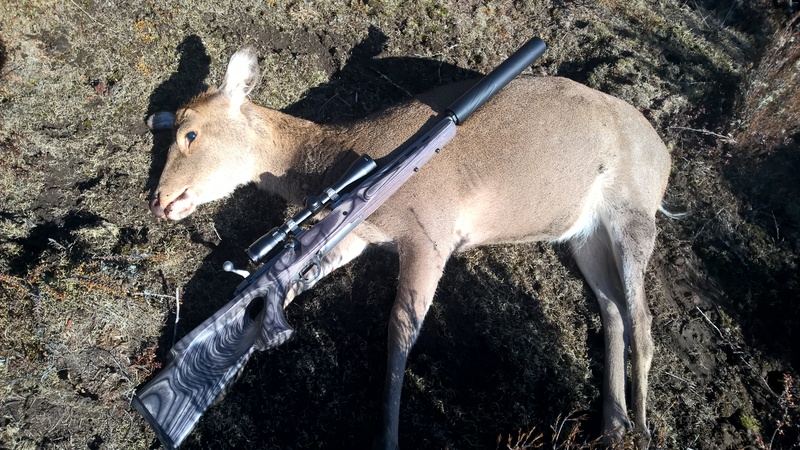 Saw what I thought was a pair of ears in the scrub about 400 meters away, looked through the binos and sure enough it was a hind. Turned my vid cam on and scanned trying to pick her up again, got a glimpse so I decided to get closer. Tia new something was up and was getting excited as we snuck in to 200 meters. Lined the cross hairs up inside the point of her left shoulder, breathed out, squeezed the trigger..Boom..saw her tip over in the scope and heard a good whack…awesome. Looked at my camera and realised I hadn’t hit record!! 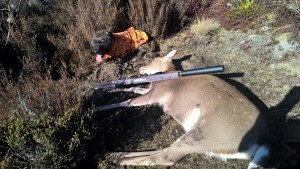 Tia did her job and found the hind quick, would have been a pain without a good dog. Very large Sika hind (possibly a hybrid) and great freezer filler!